This is an interview conducted by John Kenny and I for Albedo One #5, published in 1994. As I recall, all the really insightful questions were asked by John. Well mainly I just answer any ques­tions that anyone might have about my perspec­tive or my work or re­search that I’d done. This time someone asked me a very intel­ligent political ques­tion that I didn’t really feel equal to answer­ing because I don’t think of myself as a political writer. I’m more involved in the science end of science fiction more than forecasting politics or anything like that. I’m not actually well travelled at the mo­ment so I haven’t had the experience of seeing things from different cultural per­spectives. So it was an education for me as well as anyone who was asking questions and wanted to know something. Writing’s a fairly private affair. To what extent do you feel the need to per­form when you’re at these public gather­ings? Generally people want people that they’re interested in, particularly readers who want their authors to be interesting and many people who are writers are also somewhat introverted and not particularly given to performing and if you are able to talk easily to groups of people, if you enjoy talking to groups of people then you’ve got it made and if you don’t you either stay away from these things or you get therapy or training or whatever it takes. But when I am asked to speak to a fan group or I’m asked to appear at a conven­tion I feel that everyone who wants to talk to me should be able to talk to me and I feel that I should make myself available to anyone who wants to ask me a question or introduce themselves to me or whatever because when I go to meet somebody, a writer I admire, I like being able to walk up to them and introduce myself and tell them the effect their work had on me. Because when you think about it, read­ing is private and really somewhat inti­mate, you know, to take someone else’s words into your mind and think about them, so quite often people who have been effected by something that they’ve read, and very deeply effected by it, feel a need to tell the author that I was moved by this or I really liked this or, in some cases, I didn’t like this at all or I disagree with you and I want to know what you were thinking when you wrote this. And if somebody is going to go to the trouble to bring me in for that I’m going to go along with it. These days there’s a lot more touring around. It seems it’s more required of an author that they really put them­selves across through the media: TV, radio, conventions. For one thing it’s easier to get around now. But, also wherever you are, whether you’re an American or Irish or English or whatever, we are an experiential culture. That’s one thing that we all have in com­mon. We all have television, we’re visual, we’re experiential, we want to be there and conversely we want it to be here with us, So, it means more to people when they can have the experience of some kind of personal contact. This is why rock con­certs will never die out. People want to go hear the band in person, live, they want to have the live experience and then the re­corded experience keys the memory of having the live experience. No matter how good media gets in the future everyone’s still going to want to do it first hand. Are you saying that in the long run virtual reality won’t become a huge multi-national, globe-spanning phenom­enon? Oh I think it will, but I don’t think it’s going to replace anything. I think it’s go­ing to be extra reality. It’s going to be one more option, something else you can do to entertain yourself and you can do this for a while or until you get tired of it, you can do it ’til you run out of quarters, because TV, video games have not replaced board games. Video games have not replaced card games. You can play monopoly on a video game, but people still like to get together and have the board and have the pieces in their hands and move it around. It’s just something else that you can do. It’s another way, and a different way, but one doesn’t replace the other. Virtual real­ity is one more reality you can have. You’ve got books, you’ve got audio books, you’ve got movies, you’ve got TV, you’ve got virtual reality. How can you say you’re bored? It’s basically a movie. They see a movie and they see a guy with a gun and at some point they’re cued to tell them to freeze and the suspect freezes and they have to learn to read body language; is he going to drop his gun or is he going to try to kill you. That’s a virtual reality experience. They don’t have all the gloves and the head mounted monitors but that is virtual real­ity. It’s like, we’ve always had virtual real­ity, it’s right up here (points to head) so all we’ve done is externalise it. And I think that’s all that any artist of whatever type, a painter or a writer or a dancer or a musician tries to do. You bring it out of your head so that other people can have the experience that you’ve had of it. Where with Synners identifying two types of peo­ple in terms of virtual reality: there was one kind that wanted to externalise and there’s another kind that wanted to climb into it and close the door shut behind. You’ve been described as a cyberpunk technofeminist. What do these labels signify and how do you feel about labels being applied to you and your work? (Laughs) Labels serve their purpose in that everyone has a right to know what the contents are. Readers have a right when they pick up a book to know what kind of book they’re picking up, you know? It’s wrong to trick a romance reader into tak­ing home a near-future thriller. So that’s OK. But, eventually it can go too far. It’s like a tourniquet. A tourniquet serves its purpose but you can’t leave it on a limb indefinitely or the limb goes bad and has to be cut off. And that is what a label can dosometimes. Sometimes a label can con­strict or pigeonhole. People call it cyberpunk, they call it technofeminist or whatever and it’s just a desire to define it to their own satisfaction or to explain what they’re talking about to someone else. I don’t mind the label technofeminist, that’s pretty inventive but that’s not all I am. It’s like cyberpunk; nobody likes the word but it seems to be the word that when you say it everyone knows what you’re talking about. 1 don’t mind it for that, but that’s not all I am anymore than – like you work on a magazine – well that’s not all you do: you’re somebody’s friend, you’re somebody’s lover, you’re somebody’s neighbour, you are a lot of other things and so am I. It’s like I’m not just one kind of writer and I’m not just a writer. Your latest book Fools has quite a com­plex plot. Oh boy! Sometimes people say to me how did you keep track and I have to be honest with them: I don’t know. Actually it wasn’t that hard to keep track. The only thing that 1 had to remember with Fools was to have the wrong person show up. It could never be the right person for the right situation or the story was over. Fools came out of my research in to Multiple Personality Disorder. I’m not saying that I was researching it for scholarly purposes. I was trawling for ideas. It’s a very intriguing thing and it is a survival mechanism for people who have endured unspeakable things. In some ways we all utilise that; you go to the bank and you act one way and you go to a party and you act another way. And you treat your employer one way and who you work with another and we prepare a face for all the faces that we meet in a way. And Multiple Personality Disorder is this taken to its extreme. It’ s like, if you could find a way to just use this for your own purposes, it has entertainment purposes but also, like, sooner or later law and enforcement would get involved. You could use it for deep undercover, you use it for espionage, you could use it for thousands of things. So I was thinking if you have trade in memo­ries, if you have trade in states of mind, every time you have commerce, you have crime and if you have crime you have law enforcement specific to that crime. Right now there’s the homicide department and there’s the robbery detail and there’s the bunko squad and the SWAT teams and all that. So I was thinking that if you have commerce in mental states then you have crime and if you have crime you have law enforcement to deal with it. And I liked the idea of taking the idea of brain police, which is something I got off a Mothers of Invention album from Frank Zappa in a song ‘Who are the Brain Police?’, and I thought wouldn’t it be interesting if the brain police weren’t thought police but people who were actually trying to protect your brain. And one thing my mother al­ways said to me when I was growing up was, ‘whatever you do get a good educa­tion because they can’t take that away from you.’ I thought, ‘what if they could?’ What if they find a way to take the last thing that they can’t take from you away? And then I was doing more research; you see, for me information is kind of a flea market. I take it home and I cobble it together and I make something out of it. And I was reading about things that can happen to you, kind of scaring myself I guess, and it occurred to me that in some ways people are what they remember, how they remember it. When I was in High School this guy who was a year ahead of me was in a terrible car accident and he suffered a very bad head injury and when he came back he really had almost no memory of his life as it had been lived up until then. He didn’t remember his friends in the same way, he didn’t remember his school in the same way. And it was like he was somebody else. He wasn’t the kid that we had all known. In some ways he was very much like that but he didn’t have all the information to be him anymore. He had to start over. You think to yourself, ‘if I could do it all over again, I might do that differently or I might not do this or I might do more of this’, and that’s what happened to him. He had to do it all over again and it was all different this time. Some things he reacted to differently. He was fairly handicapped as well, there was that added thing. There have been cases of people who have suf­fered very mild strokes and there’s no clue they’ve suffered a stroke except they sud­denly undergo a change in personality. There was a case, many years ago, of this woman whose husband became more and more reticent and more reclusive, and they weren’t going out at all, they were in their fifties or sixties, and finally she said, ‘How come we don’t go out anymore. We used to go to shows and we used to visit friends. And he said, ‘Because I happen to know that you’ve been sleeping with every man in town and I don’t want to run into all these men that you’ve been in bed with.’ And she was like, ‘Oh my God.’ There was no clue, there was nothing like this in their relationship. Well the man had suffered a mild stroke and he had this delusion and that was it. And that was the whole prob­lem. Once he was treated he was himself again. Himself? Which self are we talking about? Now what all this has to do with Fools is all of this kind of congealed in my mind and I was intrigued with exploring that part of the future that I had created for Mindplayers. Fools and Mindplayers are set in the same future but they have abso­lutely nothing to do with each other. One is not a sequel or prequel or anything like that. Although there’s one character who makes a walk on in Fools and I just did that to have a private joke with myself. But all of that intrigued me; I thought, well, let’s explore that: what would hap­pen if you were someone deep undercover and you didn’t know it? And you didn’t know that you had agreed to do this. And if you found out about it, without chang­ing, without having the personalities that are submerged, if you found out that you were actually law enforcement and you decided that you wanted to live the life that you were pretending to live, what could you do about it. And also, I wanted to write a future crime story with a future crime in it. I didn’t want to write about a bank robbery in the year 2050. 1 wanted to write about a crime that could only be committed if we had this particular capa­bility and level of technology. Fools is published as a paperback origi­nal. What do you think the thinking was behind releasing it as such? Who knows what a publisher is think­ing. (Laughs). It’s notoriously difficult to get a paper­back original reviewed by the quality press. Apart from that are there any other disadvantages, or advantages, to having your book published in that for­mat? My problem is that I’m not experienced enough as an author. I haven’t written that many books yet. I have three novels in print and two short story collections. I grew up very poor and I loved books but we couldn’t afford to buy books so I used to go and haunt the public library. And in those days the library wasn’t as well stocked as you’ll find public libraries now. There wasn’t a lot of the really current fiction. I’m one of those people who thinks that authors should be paid a fortune and books should be free. I haven’t figured out how to do this economically; it doesn’t make any economic sense at all but I wish that writ­ers could get paid a fortune and that any­one who wanted a book could have one. I like paperbacks because they make work more available to people. And it makes it easier to take on an airplane, they’re lighter, easier to carry in your pocket. I just haven’t been at this as much as many other writers have. I’m happy to be generally available to people. It’s like, 1 like to be accessible, I want my work to be accessible to anyone who wants it. And it seems to me that paperbacks fit that description. I guess I’m just a paperback writer. 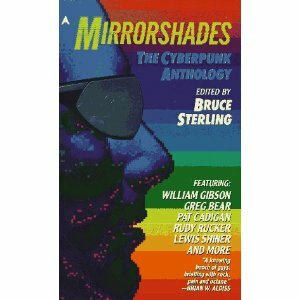 Looking back to the early eighties when Bill Gibson, Bruce Sterling, John Shirley, Lew Shiner, yourself and oth­ers were writing the stories that were to found the so-called cyberpunk move­ment, did you realise that this was hap­pening at the time, did you feel part of a movement or new wave? Didn’t have a clue. I was real busy in the early eighties. That was right around the lime 1 got pregnant and I’ve got an eight year old son now. So I was working this full-time job and taking care of this baby, or’getting ready to take care of this baby and trying to find enough time to keep writing stories and everything. And one day I got this big brown envelope in the mail and the return address said Vince Omni Veritas, Texas and I thought, ‘What kind of weird fan mail am I getting now’ because the weird part is I’ ve always gotten fan mail, I mean, I don’t get big bags of it or anything but people have always writ­ten to me. And I thought, ‘What weirdo is this and how did they get my home address?’ And inside was a bunch of fanzines of about maybe one or two pages each called Cheap Truth. And this was the cyberpunk mani­festo stuff. I didn’t know what it was. And I didn’t realise it was Bruce. I knew Bruce but didn’t know that Vince Omni Veritas was him and didn’t know that he was producing Cheap Truth. And there were all these articles in it by pseudonymous people, like Sue Denim, Pernella DeChollo and several other people. And all of a sudden they were talking about this new hard science sort of thing and inside was a letter saying great story in, there was an anthology called Light Years and Dark, edited by Michael Bishop, great story in that anthology, that was really terrific. And that had come out in 1984 and the anthology itself had sort of disappeared and there was a lot of good stories in it, some were reprints and some were origi­nals, and that was where my story Rock On had appeared. And Rock On I had written in 1981 for Gardner Dozois because he was trying to sell an anthology of science fiction rock ‘n’ roll stories so I just wrote it on a lark and sent it to him and he said. This is an incredible story; you just took the next step.’ I was just a beginning writer then, I hadn’t sold that many sto­ries. 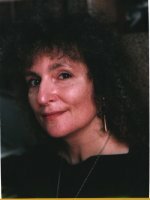 So I went to the World Fantasy Con­vention in New Haven in 1982 and Gardner brought the story and said you’re sched­uled for a reading and I want you to read this story. I didn’t really know him then. I met him in 1983 at the World Science Fiction Con­vention in Baltimore. I sort of kept running in to John Shirley here and there, and then Bruce was there and Bill was there and John Shirley was there and Rudy Rucker was there and we had a great old time together but I didn’t get to spend a whole lot of time with them, you know running around at conventions you get really nuts at these things. So then the next I knew Bruce was putting together Mirrorshades and he asked me which story I wanted to go in it and I sent him Rock On and Pretty Boy Crossover which hadn’t been published then. That’s one of the stories I wrote when I was pregnant and I’d been out dancing in a punk club, four and a half months preg­nant, dancing around with leather-clad punks, with Ellen, Ed Bryant was there and some other people, we had a wonder­ful time. And then I went home and I started Pretty Boy Crossover and I fin­ished it later that month and I sent both those stories to Bruce for it and said, ‘I kinda hope that you take Rock On because something tells me that you’re going to need more females in this book, more stories about females.’ I’d no idea I was the only female writer on the table of contents. Rock On was used as part of an anthol­ogy on how to write science fiction. Considering that you didn’t really know of Bill Gibson et al before you met them, the fact that you were all initially writ­ing in isolation from each other, do you believe that there’s some kind of pheromones in the air that infect writ­ers on the same wavelength or do you just think that the time is right for certain new ideas? Well, I think it’s a little of both actu­ally, and I’m really not trying to cop out with an answer like that, but if Bill and Bruce and John and Rudy and I all sit down together and start talking we’ll find that there’s an awful lot of common ground in our interests. We’re all of the first genera­tion that grew up with TV. We’re all enthusiastic fans of rock ‘n roll. We all like much the same bands and the same kind of music. It’s like people with a lot in common seizing on the same elements to work into their science fiction. This is how you can tell it’s a genuine movement be­cause it arises spontaneously. People all kind of get the same sort of gestalt. And that’s really how it happened. And it was more likely to happen in this culture because the media gets our ideas out there at the speed of light. We could all see the same thing at the same time on television. It didn’t take as long as it used to for ideas to get from one part of the country to the other. When I sit down at seven o’clock central time to watch televi­sion someone else on the east coast of America is watching it at eight o’clock East Coast Time and someone else in the Rockies is watching the same thing at six o’clock Mountain Time and someone on the west coast probably got it delayed because it’s five o’clock there and they’re all coming home from work. On that point, the media seem to have just cottoned on to the whole idea of cyberpunk in the last two, three years, maybe four, whereas cyberpunk, in writ­ten form, started about ten years ago. A lot of the original cyberpunk writers are moving off in different directions now, and the media seem to be just exploring the idea. Do you think cyberpunk is passe? I don’t think it’s so much passe as it’s just been absorbed into the mainstream now. It’s part of the culture and it’s going to stay part of the culture. It’s not going to be replaced by something; it’s just one more aspect of our culture. The way I see it is we sort of foreshadowed the cultural shift, we foresaw the cultural shift. Cyberpunk is a cultural shift, not a literary movement, really, and this has happened quite frequently with speculative fiction and science fiction writers. They have foreseen things, they’ve felt things com­ing. And if you see how things are now, they are not exactly as were predicted in many of our stories. Or if you look ahead from now you can see that things may not happen exactly as someone wrote them up in whatever story or novel. But the cultural shift was on the way and cyberpunk as a cultural phenomenon was not possible until the desktop compu­ter. That completed the triad of the desk­top computer, the television and the tel­ephone. Now they’re all one. Some day they will all be one organism, one simple thing in your house and you’ll be able to access it from whatever room you’re in. The fact that they are not all one now is we just haven’t worked out the design of the cabinet and how to do that. But your per­sonal computer with the modem in it is TV you can read and phone out on. Very soon that will merge with your television so that you can maybe devote part of your screen to TV and part of your screen to whatever you need to do. You can keep your calendar there. And you can pick up the handset if you really need to talk to someone by voice. You’re promoting Fools at the moment, but you probably have another book in your head. Do you find that a difficult thing to do, because you’re talking about a book that you’ve written quite a while ago? I thought, ‘This is either going to go over or it’s not. And if it doesn’t go over, it’s not going to go over in a big way. People are going to ask me if I was crazy.’ And so I was gratified by the response to it because the response to it has been more positive than I really expected. People have said, ‘You know, I’m going to read it again’. This entry was posted in Albedo One, Interviews and tagged Asimov's Magazine, Bruce sterling, Cheap Truth, Ed Ferman, Ellen Datlow, Frank Zappa, Gardiner Dozois, Isaac Asimov, John Shirley, Lewis Shiner, Michael Bishop, Mirrorshades, Mothers of Invention, Omni, Rudy Rucker, William Gibson. Bookmark the permalink.